Chanukah candles have that classic look: colored, twisted. 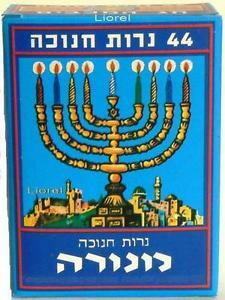 The old traditional blue boxes used to have a prominent number 44 on the box, because that’s the exact number of candles needed for one Menorah throughout Chanukah. More on that later, but first two stories about the number of candles in the box. #1) This week while Raizy was tabling a non-Jewish student stopped by and asked, “Why does the box have 44 candles if the holiday is only 8 days”? So Raizy explained that while the first night is only one candle, the second night has two, third night has three and so on. 8 candles would be too few to accomplish that incremental nightly increase. #2) A few years back when I (Mendel) was out tabling, also with Chanukah gear, some guy came over and made a mistaken calculation asking if there should be 64 candles in the box, since 8×8=64. Both these people are wrong, and there’s an important lesson in that. In story #1 she thought one candle or one lighting does the trick. In story #2 he thought that each lighting needs to be all 8 candles. Both of these are mistaken notions. Judaism wants us to grow, to add, to increase, but it expects that increase to be gradual, step-by-step, and not all at once or all the time. This is not just a Chanukah message but a year ’round message. Continued growth is essential, as Rebbe would say, “Every living thing must grow” but healthy growth doesn’t happen all at once or overnight (aside for in fairytales) but takes time, effort, persistence, one step, one candle at a time.